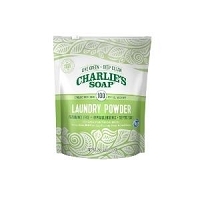 Charlie's Soap Laundry Powder. 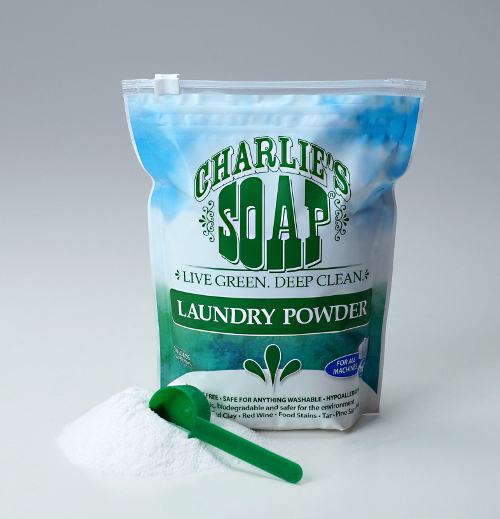 Charlie's Soap Laundry Powder is a laundry detergent originally developed for use in textile quality control labs. It is formulated to work specifically with fabrics and clean all the way to the fibers. 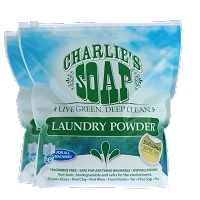 Charlie's Soap is truly the answer for the cleanest clothes, cost savings on laundry and caring for the environment. 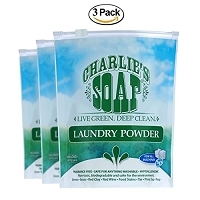 Charlie's Soap Laundry Powder is a clear, scent-free laundry powder that cleans thoroughly, rinses completely, and leaves nothing behind but the sweet smell of clean. FREE SHIPPING WITH QUALIFYING MINIMUM PURCHASE. Q: Is this product sold in stores? A: Yes, this is sold in thousands of stores including some national retail chains. Our prices are very competitive with the national chains and often the same or lower than you can find in local stores.